Vista Shipped today (View Bill Gates at 500K)! Today I wanted to share what I consider an incredible story of Vista. Yes, I'm "Wow'd" by the 3D flip. I'm depressed that my un-upgradable PC still has blue title bars instead of glass. I'm rely more on local search now than good organization skills, but that's not what I want to talk about. Today, my team had a conference call with some of our partners in Shanghai, China. 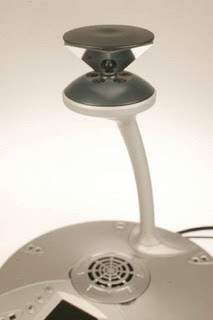 Lucky for me, Microsoft provides some pretty sophisticated Video Teleconferencing Systems. Unluckily for me, having to go through a specific receptionist to book the room, and some terrible web UI to book the equipment, which by the way, is supposed to come with help and didn't. It wasn't the best experience. Thinking I had it all setup, I found out that my converstion from Redmond time to Shanghai time, was incorrect, and I had booked the room an hour off in China, and it was already taken by another group of folks. Dropping back to our standard "voice-only" call, we started. A few minutes into the chat, I figured... "hey, there is only one person on the call from China, at least we can see him. ", I fired up my IM client and started a video conference. Un-pixelated by packets being crushed under the ocean, he popped onto the screen. Looking around, all we had was the highly complex video phone, Microsoft's "RoundTable". We quickly discovered the USB cable attached to the device and plugged it into my Vista laptop. Automatically Vista began searching for drivers. Clicking the "Show Details", we realized this is really a high-tech device, with at least 8 different services to provide to Vista PCs. My co-worker tells me to push play on my video feed, as soon as the driver is installed for the Video camera portion of the phone. Instanly, our images were broadcasted over to China, and our peer over there started laughing. You see, what we hadn't counted on was the camera provides a 360 degree image, squished into a 4:3 picture frame. You can imagine how "pancaked" we looked to our peer in China. Anyways ... Vista rocks, no reboot needed for camera install *AND*, I started using the camera *BEFORE* the phone was completely installed. You're going to think I'm nuts, but I posted a comment on your Oct. 25, 2004 blog. I'm stuck and getting totally frustrated. Hope you can spare a moment to help a gal out. Thanks! This is a really good way to start a persuasive paper https://persuasivepapers.com/how-to-start-a-persuasive-essay/. You would have a chance to get familiar with this.